Printing custom feather flags are one of the most efficient methods of advertising. They are the perfect outdoor and indoor signage solution for drawing attention and promoting a business, special event, grand opening, product or service at trade shows etc. The possibilities are endless. The feather flag is printed one side only on light-weight, flame resistant durable 3oz Polyester fabric. Optional hardware is available for indoor and outdoor use. The pieces of equipment are included in a convenient carrying case for easy transporting. For outdoor use, optional hardware consists of a pole and ground stake, or cross base and pole for indoor use. Please view our final flag heights once they have been placed in the stand. 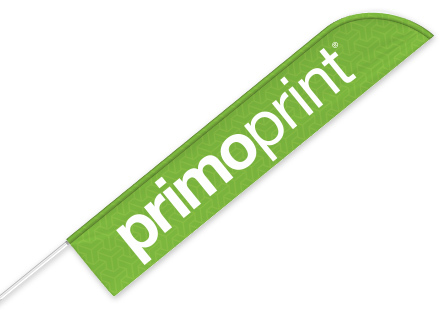 Material and Printing: Our promo flags are printed single sided on a lightweight, flame resistant 3oz polyester using superior sublimation equipment, for the longest lasting color of any type of printing available for fabric. Available Hardware: We offer an outdoor ground stake with pole as well as an indoor “X-stand” which can be used outdoors with the included water tube to stabilize the stand. If you do not select a hardware option you will only receive the fabric flag, no pole. How to Care for Them: They can be machine washed in cold water with mild detergent using the gentle cycle, no bleach. Tumble dry on low to prevent fabric shrinking, and steam to release wrinkles if necessary. Please Select 24" x 81" 32" x 99" 32" x 123" 36" x 123" 37" x 161"